We’d love your help. Let us know what’s wrong with this preview of A World Without Heroes by George Charles Roche III. This ringing defense of Christianity, humorous, insightful and uncompromising, takes careful and timeless aim at those ideas which Roche claims have shriveled the will of the West. 9 cassettes. To ask other readers questions about A World Without Heroes, please sign up. The method for suicide of western civilization. 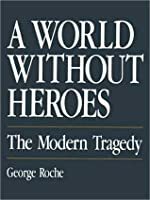 An extensive examination of what the author calls the 'anti-hero', and not nearly so much of the hero and the spirit of heroism. The work delves deeply into history for the source of the beliefs, really philosophies, of the anti-hero clearly showing that, as my preacher said, “people believe a thing, because they believe it”. Having nothing to do with fact or the truth. A result is wished for, so a conclusion is created to result in an outcome to pro The method for suicide of western civilization. The work delves deeply into history for the source of the beliefs, really philosophies, of the anti-hero clearly showing that, as my preacher said, “people believe a thing, because they believe it”. Having nothing to do with fact or the truth. A result is wished for, so a conclusion is created to result in an outcome to produce it. I cannot do justice to this book in a review, and you wouldn't want to read it if I did, but this I'll share here. You have to pay attention. It is not a book that you can get away with giving it your partial listening, and it is far from low level intellectually. The author absolutely destroys the modern educational model, based on the god of man and relativism, evolution, and it's end products of tyranny and barbarism. In detail you are shown what is wrong with public education and how it could simply, though not easily be reestablished to be an asset to those it now serves to ruin. An indictment of the modern 'science god' also. The author George Roche concluded the book in 1987, which would put it at the end of the Presidential term of Ronald Reagan. The high water mark of modern principled civilization in this country. The author comes to conclude in my opinion, that our country is undergoing and laying the foundation to continue a return to those high values we once held. Seeing things as they are today, I can't help but say he was wrong to conclude this, as we have sunk into a sewer kind of society. Nevertheless, and though his 'anti-hero' would more accurately be described as 'anti-Christ', yes Virginia! There are still heroes. The author has arbitrarily determined that believing in god is heroic and not believing is anti-heroic. His arguments were vapid and his conclusions were biased. Roche was making moral assumptions that were not necessarily true and attempting to find ways to vilify any persons who he deemed did not agree with his theology. It was certainly ironic to read the author's criticisms of sexual depravity only to discover that during the time he wrote this book and for another 12 years (until she committ The author has arbitrarily determined that believing in god is heroic and not believing is anti-heroic. His arguments were vapid and his conclusions were biased. Roche was making moral assumptions that were not necessarily true and attempting to find ways to vilify any persons who he deemed did not agree with his theology. I'm not a scientist but I read science and listen to science podcasts and with the information I've gleaned from these channels I was easily able to refute most of the misguided author's arguments against Darwin, evolution, and general science which took up the last third of the book. Granted, the book was written in the late 80s and there have been advances in microbiology, genetics, and almost every other branch of science which the author was unaware of at the time this book was written. The I'm not a scientist but I read science and listen to science podcasts and with the information I've gleaned from these channels I was easily able to refute most of the misguided author's arguments against Darwin, evolution, and general science which took up the last third of the book. Granted, the book was written in the late 80s and there have been advances in microbiology, genetics, and almost every other branch of science which the author was unaware of at the time this book was written. The book is basically a flawed attempt at defending the possibility of the supernatural and the argument that Christian beliefs should prevail in every facet of life. The author argues that there no more heroes (maybe there weren't in 1987, I can't remember) and labels progressives in society as anti-heros. Like many other ultra-conservatives he bashes the public school system and fills pages with the now tired, old mantras. But the Darwin bashing was extremely infuriating to me. I've heard enough scientist vs. creationist debates and read and heard enough Dawkins (and others) that refuting the believers' nonsense is not even a challenge. It's beyond me why creationists continue to disparage the theory of evolution by bashing Darwin, when the theory has advanced so far since. He wrote On the Origin of Species with no knowledge of DNA, modern genetics, or microbiology. What an amazing achievement. Yet creationists such as the author try to belittle the theory of evolution by pointing out what Darwin may have missed, or got wrong. That's like saying astronomy is bunk because Copernicus didn't identify Uranus or Neptune, despite all that we've learned since Copernicus from the Hubble, space craft visiting other planets, walking on the moon, etc. The author also tries to belittle evolution by pointing out gaps in the fossil record. Oh, creationists! Nitpicking scientific theories which may still have holes (for now.....give science time) while accepting the belief that all they see around in the universe is the result of some all-powerful wizard in the sky. Where is their proof? A book written by Bronze Age primitives, with no updates or sequels since? OK. Excellent book, although a little dated as he references current events & movements that are no longer current (copy right 1987). This book is right up there with “The Culture of Narcissism: American Life in an Age of Diminishing Expectations” by Christopher Lasch & “The Closing of the American Mind: How Higher Education Has Failed Democracy and Impoverished the Souls of Today's Students” by philosopher Allan Bloom. Very well written & thought provoking work. Adam C. Zern shares his thoughts . . .
"I learned of this book while listening to a speech by Dallin H. Oaks. He referenced a particular quote from the book and I became interested. George Roche, the author, was president of Hillsdale college at one time. The subject matter of the book deals with what the author considers very counter-productive and even destructive modern philosophies, which he labels "anti-hero." Most of his commentaries, for that is what the book mainly is, are lucid and his a Adam C. Zern shares his thoughts . . . The subject matter of the book deals with what the author considers very counter-productive and even destructive modern philosophies, which he labels "anti-hero." Most of his commentaries, for that is what the book mainly is, are lucid and his arguments are strong. The book wanders a little and some of what he says feels redundant but I enjoyed the book overall. His commentary on the modern outlook of science and what he calls "scientism" is especially interesting and accurate. I enjoyed the book and would recommend it to anyone who enjoys reading social/academic commentaries. 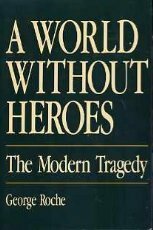 A World Without Heroes: The Modern Tragedy is probably the closest to a type of book that I would be most likely to write in the future." It's true that the gifts and call of God are irrevocable. It's also true that ignorance is bliss. I did not know until I finished what amounts to a magnum opus on thinking that Dr. Roche was embroiled in scandal toward the end of his life--so I read the book with open heart and mind, and for that I feel I have been rewarded. This is an amazing work. While some of it is dated (in regard to the Soviet Union), some parts are eerily prophetic, and indeed resound full and round into our times, into t It's true that the gifts and call of God are irrevocable. It's also true that ignorance is bliss. I did not know until I finished what amounts to a magnum opus on thinking that Dr. Roche was embroiled in scandal toward the end of his life--so I read the book with open heart and mind, and for that I feel I have been rewarded. This is an amazing work. While some of it is dated (in regard to the Soviet Union), some parts are eerily prophetic, and indeed resound full and round into our times, into this very moment. Roche put together a reference standard here. A terrific book full of stuff I wish I could remember to support my own arguments. Lots of great quotes. A bit preachy, and the author lost me when he bagged all modern art and music as basically degenerate. He would hate what I'm listening to now. A very solid defense of the Christian world view. Great so far - learning about everything from the Theory of Relativity to anti-hero and beyond. Why heroes are important, the culture in which they thrive, and how to raise my boys to think, act, and be everyday heroes. Comes a little stronger than I would put it, but I really liked his imagery, quotes, and analogies. A prose on the anti-hero (mass man) and the defeatist culture that threatens to spread the viruses of apathy, mediocrity and immorality through our culture. George Charles Roche III (May 16, 1935 – May 5, 2006) was the 11th president of Hillsdale College, serving from 1971 to 1999. Roche received his bachelor's degree from Regis College (now Regis University) in 1956. He later received a masters and Ph.D. from the University of Colorado. Prior to becoming president of Hillsdale College Roche was a professor at the Colorado School of Mines. He also work George Charles Roche III (May 16, 1935 – May 5, 2006) was the 11th president of Hillsdale College, serving from 1971 to 1999. Prior to becoming president of Hillsdale College Roche was a professor at the Colorado School of Mines. He also worked with the Foundation for Economic Education. The Center for Constructive Alternatives seminar program and the college's widely circulated speech digest, Imprimis, were started during Roche's years as college president. Under his leadership, many new buildings were constructed, including a sports complex that bears his name. Roche authored many books, such as Legacy of Freedom, The Bewildered Society, and The Book of Heroes, although it is believed that Lissa Roche, his daughter-in-law who worked at the college, was the ghost writer for his later books. In the case of The Book of Heroes Lissa is sometimes listed as a co-author and was acknowledged as a major contributor in the book's introduction. Roche was appointed chairman of the National Council on Educational Research by Ronald Reagan in 1984.